Even though my kids are older and I’m not teaching first graders anymore, I still love children’s books. My niece and nephew came and stayed at my house this week. It was so fun! My nephew is four and my niece is two. They are adorable! My kids had a lot of fun playing with them. We went to the lake and played in the water and sand, and we spent hours swinging and jumping on the trampoline. Night time was super fun because each of them chose a picture book to read before bed. I was in heaven! I’m still reading The Princess Bride to my kids—it’s taking us forever to finish—and that’s fun, but it’s not the same as the picture books! So I was excited to join the blog tour for Kitty Stuck. I hope you enjoy my book review of Kitty Stuck by Emma Pullar. 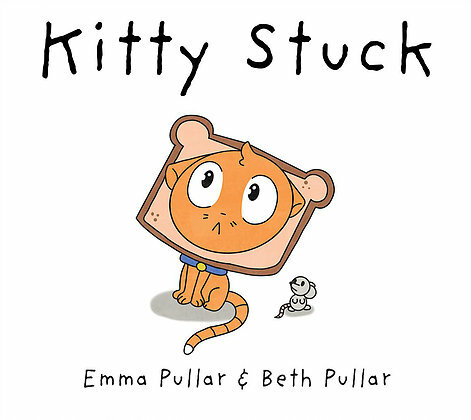 Kitty Stuck is Emma Pullar’s second children’s book. Her first, Curly from Shirley, was a national bestseller and named best opening lines by New Zealand Post. Upon her return to the UK, Emma shifted her writing focus to writing dark novels for adults. Recently, when inspired by her 12 year-old daughter Beth’s drawings of the family cat Rupert, she took up her pen and wrote Kitty Stuck. Beth, a talented and dedicated young illustrator, hopes to use her royalties to develop her work by investing in art supplies, software and education. I think it’s darling that a mom and daughter duo wrote this book! How fun! Wouldn’t it be exciting at 12 years-old to tell your friends you’re a published illustrator? Kitty Stuck is a cute story about a cat that keeps getting stuck. He gets stuck in so many places! I would get frustrated if I had to keep getting my kitty out of sticky situations, but not this family! They calmly pick him up, unwrap him, untie him, and get him out of wherever he’s stuck. They all seemed patient except for Dad. He did yell, “Drat!” at one point. That’s more realistic. My favorite place he was stuck was in the bowl. That illustration is super cute. The illustrations and words are very simple, but they’re cute. My daughter loved finding the little mouse on every page; she thought that was a fun idea. I didn’t love reading the book on my Kindle, though. Children’s books are 100 times better to read when holding a real book. You’re in luck! I checked on amazon and this book is out in paper, so hooray! I’d get it in paper for sure. The littles will love the cute pictures of the kitty. This is a cute book that little children will enjoy! Disclosure: I did receive a free copy of this book in exchange for my honest revew.